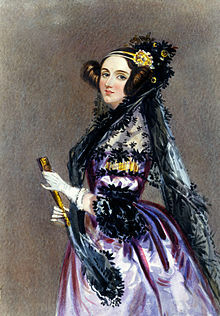 Portrait of Ada Lovelace, 1840. Ada Lovelace was born 200 years ago today, on 10 December 1815. She became a highly respected British mathematician and writer, known mainly for her work on Charles Babbage's early mechanical computer, the Analytical Engine. Her notes on this machine include what is now thought of as the first set of instructions intended to be carried out by a machine, or the first computer program, and she as the first computer programmer. She was born Augusta Ada Byron and inherited the title Countess of Lovelace later in life. Her father was the poet Lord Byron, but she never knew him, as he left his wife a month after Ada was born. She had her mother Anne Milbanke to thank for setting her up with an interest in mathematics and science, but Ada always remained interested in her father, and loyal to him, despite not knowing him. Lovelace was still a teenager when her mathematical ability led her into a working relationship and friendship with fellow British mathematician Charles Babbage. In particular she helped in Babbage's work on his Analytical Engine. In 1842 and 1843 she translated an article about the engine from Italian into English. She also supplemented the translation with a very detailed set of notes of her own. These notes contained what many now consider to be the first computer program, an algorithm designed to be carried out by a machine. Lovelace's notes are important in the early history of computers, although the algorithm was never used because the Analytical Engine was never built. She also had a realisation about the potential of computers to go beyond mere calculating. Others, including Babbage himself, focused only on their numerical capabilities. Upon her death, Ada was buried next to her father Lord Byron, in Hucknall, Nottinghamshire, at her own request. Ada Lovelace Day is now an annual event in mid-October that aims to "... raise the profile of women in science, technology, engineering and maths," and to "create new role models for girls and women" in these fields.